Qwikgear photography equipment rental in Bangalore is firmly established since 2014 as an industry leader in terms of providing hassle free services, best price, quality equipment rentals for the Bangalore Film and Photography Industry. Qwikgear photography equipment rental in Bangalore is one-stop shop providing everything you'll require from Cinema Cameras rental to Lighting rental in Bangalore. 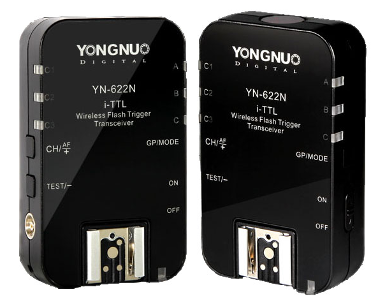 yongnuo_yn_622c_ii_e_ttl_wireless is Compatible with Canon E-TTL / E-TTL II and Support for 622 and 560-RX Communication with Frequency of 2.4 GHz ranging from 328' TTL and Manual Flash Modes and also Supports Group Ratio & Multi Flash it also has AF Assist Beam and USB Update Support with High Speed, 1st and 2nd Curtain Sync it has PC Sync Port and Super Sync Function and runs on 2 AA Batteries. The YN-622C usually utilise a series of LEDs to display the settings and allow the users to make adjustments. AF assist beam to help in low-light conditions. Multiple sync modes are available for more specific needs or effects, including 1st 2nd curtain sync.